Every day, garbage trucks drive our roadways and neighborhood streets to provide a valuable service to the community. However, when these large and heavy vehicles are not operated in a safe manner, they can cause serious accidents that leave innocent victims with severe injuries. In June of 2017, a Waste Management truck was traveling in the Valley Glen area of Los Angeles when the driver collided with the driver’s side of a pickup truck. While the garbage truck driver walked away with no injuries, the pickup operator was announced dead at the scene, and the driver of a third involved vehicle was transported to the hospital with serious injuries, as reported by NBC Los Angeles. While the cause of the truck crash is still under investigation, it exemplifies the extensive harm that a garbage truck accident can cause. In March of 2017, a sanitation truck operator crashed his vehicle into a popular donut shop in the Winnetka community. The driver was treated for minor injuries, but fortunately no one else was hurt. According to CBS Los Angeles, the incident happened at a time of morning where the shop would usually be crowded with customers inside and outside on the front patio. The owner also happened to be in the back of the shop when the trash truck barreled into her shop. Garbage trucks pose numerous dangers to the public for several reasons. Their weight causes the most obvious risk. Occupants of passenger vehicles, pedestrians, and cyclists are far outweighed by the size and weight of a sanitation truck. Not only is the truck itself massive inside, but its load can also be extremely heavy. This size disparity is a chief reason so many truck accidents end with a fatality. Skilled Los Angeles truck accident lawyers know that the need for a trash truck to stop and go also causes a substantial risk of injury. Their presence within residential communities places sanitation trucks in closer contact with pedestrians and bicyclists, including children. Drivers in the vicinity may find them unpredictable and difficult to maneuver around. In addition, trash truck operators must often back into small spaces in order to turn the trucks around or exit compact neighborhood streets. 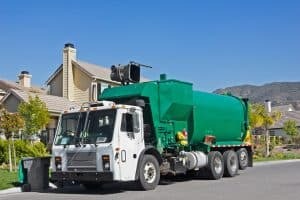 If you or a loved one was severely injured by a sanitation truck, call the lawyers with a proven track record of advocacy for truck accident victims throughout Southern California. Call Taylor & Ring today at 310-776-6390 or complete a contact form to discuss the merits of your case.